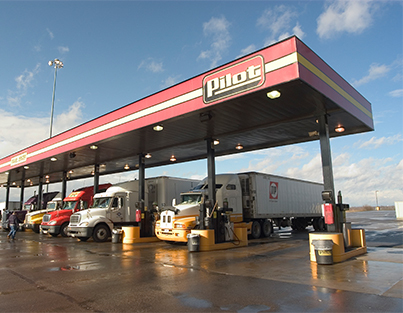 Pilot Flying J is the largest operator of travel centers in North America with more than 750 locations in 44 states and six Canadian provinces. Headquartered in Knoxville, Tennessee, the company employs more than 28,000 people. 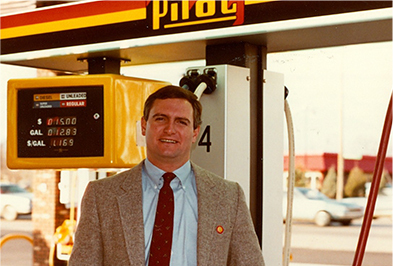 CEO Jimmy Haslam has embraced technology and moved Pilot Flying J in new directions, leading the company's growth from 1.1 billion fuel gallons sold in 1996 to more than 7 billion sold annually today. Pilot Flying J serves more than 1.6 million guests a day and is committed to connecting people and places with comfort, care and a smile at every stop. Pilot Flying J partners with national brand Bass Pro Shops to sell products at a select travel center. 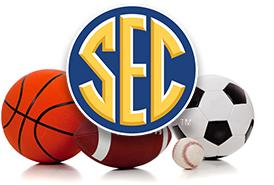 Pilot Flying J becomes an official partner of the SEC. 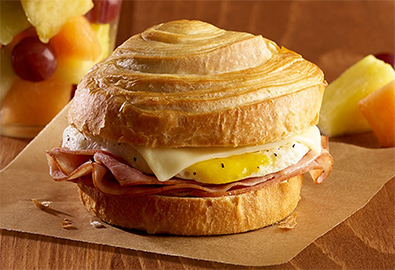 Pilot Flying J partners with celebrity chef and restaurant owner Tim Love to create new signature menu items for travel centers nationwide to provide more variety and fresh food options for interstate travelers. 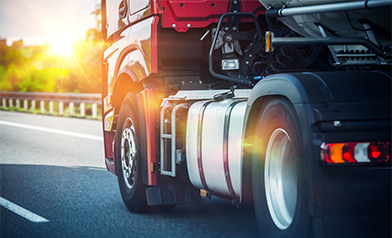 Pilot Flying J Truck Care launches roadside assistance and on-site repair and maintenance services for professional drivers. Pilot gives $2 million to renovate the West Side YMCA in Knoxville, which will be renamed the Pilot Family YMCA upon completion in fall 2018. The company operates the fourth-largest tanker fleet in the nation, with more than 1,000 trucks that travel more than 120 million miles per year delivering more than 8 billion gallons of fuel. Pilot Flying J and Marathon Petroleum Speedway form partnership in the Southeast, adding 41 former Wilco Hess stores to the company's network. Broadband high-speed WiFi is available at 500-plus locations. Pilot Flying J's first national TV commercial debuts on ABC/ESPN. Watch it here! The company steps out on the national stage as title sponsor of the Pilot Flying J Battle at Bristol, the largest college football game in history featuring the University of Tennessee vs. Virginia Tech at Bristol Motor Speedway. The company releases the new and improved myPilot app. Click here to download. Pilot Flying J Chairman of the Board James Haslam II is selected for membership in the Horatio Alger Association of Distinguished Americans, Inc. The Horatio Alger Award is bestowed upon recognized leaders who have succeeded, despite facing adversity, and who are committed to both philanthropy and higher education. Whitney Haslam Johnson, who joined the company in 2005, is named Chief Experience Officer. She also is appointed to the NATSO Foundation board of directors. Will Haslam, who started working with the company in 2003, is named Director of Giving Back. Pilot Flying J is named the No. 14 largest privately held company by Forbes and ranks No. 20 among U.S. franchisees by Franchise Times Magazine. The Haslam family and Pilot Flying J donate $10 million to Knox County Schools to refurbish and modernize high school football fields and provide academic support, as well as $2.5 million to East Tennessee Children's Hospital to build a new neonatal intensive care unit. Ken Parent is named president of Pilot Flying J, and Whitney Haslam Johnson joins the Pilot Flying J's board of directors. Pilot purchases CVC Capital Partners' investment in Pilot Flying J. 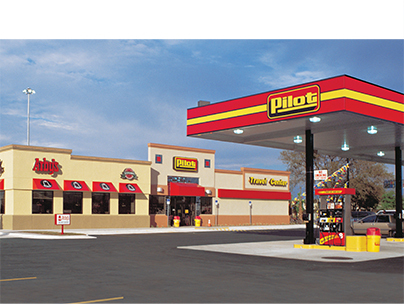 Pilot's convenience store operations continue to be fully owned by Pilot Corporation. 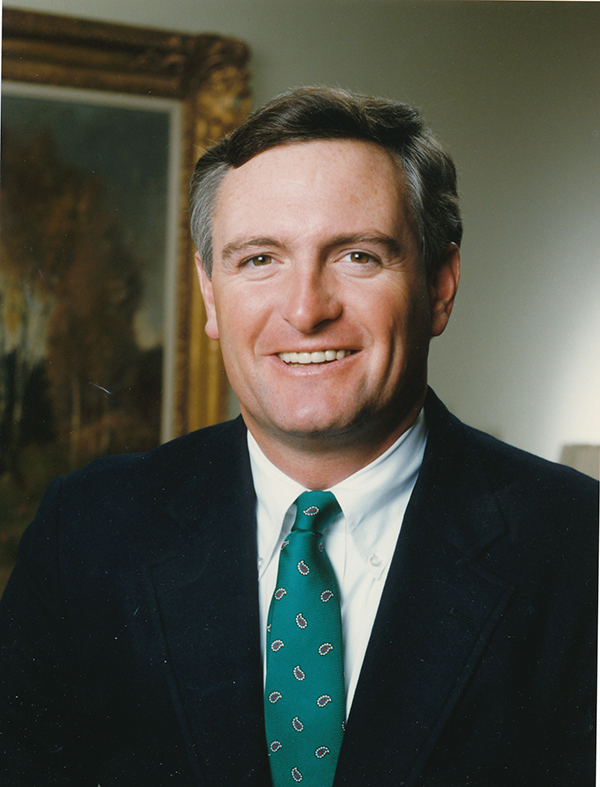 The Haslam family announces a landmark gift of $50 million to the University of Tennessee-Knoxville College of Business Administration in honor of James Haslam II. 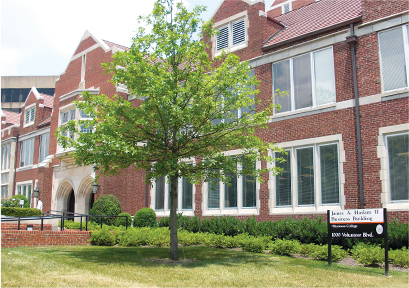 For the first time in its 220-year history, UT names a college in recognition of an alumnus and donor: The James A. Haslam II College of Business. On June 19, Pilot Flying J partners with Trucking Moves America Forward (TMAF), committing $1.25 million over the next five years to assist with the growing industry-wide movement. 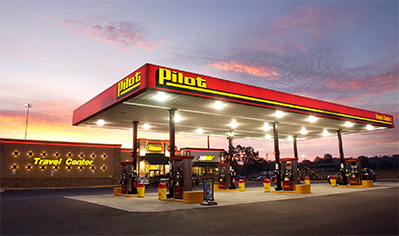 Pilot Flying J partners with Mr. Fuel to add eight stores to the network. 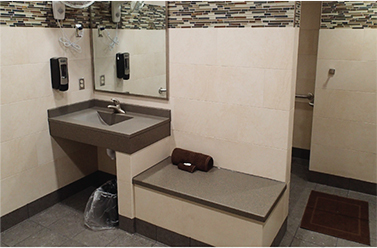 Pilot Flying J launches a $50 million renovation project to remodel restrooms across its network with new tile and finishes, low water consumption fixtures, hand dryers and LED lighting. 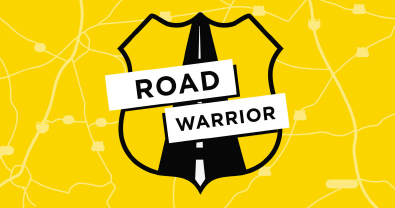 Road Warrior contest launches to recognize professional drivers, thanking them for delivering more than 65% of goods in the U.S. and keeping the economy moving. Pilot Flying J sponsors the Truckload Carriers Association (TCA) Scholarship Fund Gala, helping to raise $210,000 over the previous record of $68,000 to fund scholarships for students associated with a TCA member company. The company donates 10 percent of its proceeds from the sale of coffee and hot beverages on Veterans Day to the Fisher House Foundation. Pilot Flying J also serves as a Hero Sponsor of the Congressional Medal of Honor Society annual convention in Knoxville and gives free coffee for a year to the recipients. Pilot Logistics Services merges with Thomas Petroleum to form Pilot Thomas Logistics. PJ Fresh Marketplace launches to provide high-quality meals and grab-and-go food options, most of which are prepared in-store daily. It offers a variety of delicious, fresh food offerings, including pizza, soup, salads, homestyle meals, breakfast options and more. Diesel exhaust fluid (DEF) at the pump is available at over 3,000 lanes across the U.S., marking a $165 million investment to expand Pilot Flying J's DEF at-the-pump network. Pilot Flying J gives free gas to nearly 1,600 veterans, active soldiers and their families for Operation Tank Full of Love. The annual Pilot Pumpers event raises $86,200 for United Way of Greater Knoxville, marking a total contribution of over $1 million since the program's start. James Haslam II, James "Jimmy" Haslam III, Dee Haslam and Bill Haslam all have served the United Way as board chair and annual campaign chair. Pilot Flying J donates to expansion project for East Tennessee Children's Hospital, for which Dee Haslam serves as chair of the board of directors. James Haslam II receives the Hall of Fame award from NATSO, the trade association representing the truckstop and travel plaza industry. Jimmy and Dee Haslam each receive the University of Tennessee Distinguished Alumni Award. Pilot Flying J launches a $49 million project to remodel and upgrade travel center showers. The new MyRewards loyalty program launches. The company partners with Wreaths Across America to help honor the heroes who sacrificed their lives to defend the United States and continues to support the annual program today. Pilot Flying J acquires Western Petroleum and the majority ownership of Maxum Petroleum to form Pilot Logistics Services. Jimmy and Dee Haslam purchase the Cleveland Browns NFL franchise. 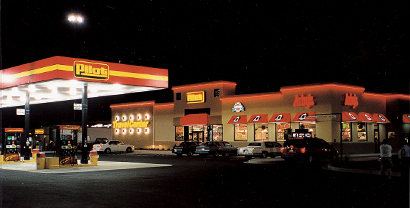 Pilot Flying J is the 10th largest U.S. franchisee with 279 nationally recognized fast food restaurants. 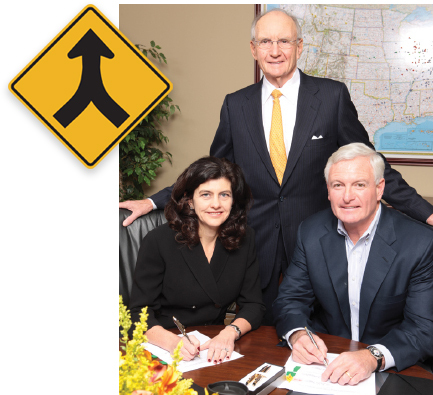 Completing its investment started in fall 2010, BDT Capital Partners buys into Pilot Flying J as an investment partner. Michael Annett joins Rusty Wallace Racing, driving the team's No. 62 Toyota Camry with Pilot Travel Centers sponsoring, and achieves seven top-10 finishes. Jimmy Haslam receives the University of Tennessee College of Business Administration's DistinguishedAlumni Award. On July 1, Pilot Travel Centers LLC merges with Flying J Inc. to form Pilot Flying J. This historic event marks the merger of two of the best-known brands in the travel center industry. Combining Pilot Travel Centers' over 335 locations and Flying J's over 215 locations, newly formed Pilot Flying J's network includes more than 550 travel centers. Pilot introduces its first mobile app. Pilot Travel Centers rolls out installation of 100 diesel exhaust fluid (DEF) locations and makes commitment to offer DEF at all travel centers. Pilot joins Twitter and YouTube and launches its first Facebook page. Michael Annett runs for NASCAR Rookie of the Year honors in the No. 15 Toyota Camry with sponsorship from Pilot Travel Centers. Pilot Travel Centers is the 17th largest U.S. franchisee with 278 nationally recognized fast food restaurants, and with 151 locations, Pilot Travel Centers is the world's third largest Subway franchisee. Pilot celebrates its 50th anniversary and donates $1 million to local parks in the company's hometown of Knoxville. In its 50th year, the company has 13,000 employees, 300 locations in 41 states and Canada and annual revenues of $16 billion. Pilot Travel Centers buys out Marathon Petroleum's interest and adds CVC Capital Partners, a European private equity firm, as a partner in the business. Pilot Corporation retains 52.5 percent ownership of Pilot Travel Centers. Best coffee on the interstate! Readers of Truckers News rank Pilot coffee No. 1, well ahead of McDonald's, Dunkin' Donuts and other major travel center chains. East Tennessee Veterans Memorial is dedicated in World's Fair Park in Knoxville with the goals to remember, honor, educate and inspire. The company continues to provide support and sponsors annual memorial fundraisers. Pilot Travel Centers is named a finalist for a Corporate Citizenship Awardby the U.S. Chamber of Commerce Business Civic Leadership Center. Pilot Travel Centers is named the No. 30 largest retailer in the U.S. by the National Retail Federation. Operating 253 individual locations, Pilot Travel Centers is named the No. 13 largest restaurant franchisee in the country by Restaurant Finance Monitor. With 135 locations, Pilot Travel Centers becomes the world's largest Subway franchisee. Pilot opens the company's first travel center in Canada. Mitch Steenrod, who joined the company in 2001, is promoted to Senior VicePresident, Chief Financial Officer and Chief Risk Officer. Pilot Flying J donates to construction of East Tennessee Children's Hospital West Tower, adding new patient rooms, emergency department and specialty clinic. Pilot Travel Centers starts serving gourmet coffee at all locations across North America. Pilot Travel Centers acquires approximately 50 stores from Williams Travel Centers. 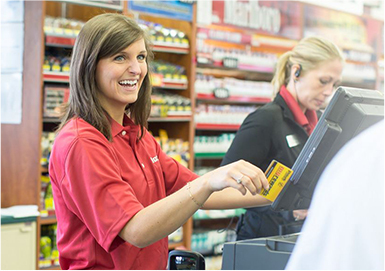 Located in 15 states, the travel centers bring the company's total network to 250 travel centers nationwide. The company launches its first loyalty program. Pilot Travel Centers sponsors 25 children on the Knoxville Salvation Army's Angel Tree to provide them with holiday gifts. Through this relationship, the company later sponsors hundreds of children annually and raises tens of thousands of dollars each year through a paper Red Kettle Campaign. Pilot Corporation joins with Marathon Ashland Petroleum LLC on Sept. 1 to form Pilot Travel Centers LLCand operates 232 travel centers. After serving as president of Pilot for four years, Bill Haslam decides to pursue other interests including public service. Bill later leaves the board of directors in 2003 and becomes Mayor of Knoxville (2003-2011) and then Governor of Tennessee (2011-2018). Pilot reaches 177 stores, selling over 1.6 billion gallons of fuel. Pilot has 164 stores, selling more than 1.4 billion gallons of fuel. Already the nation's largest supplier of diesel fuel to over-the-road trucks,Pilot ranks as the 25th largest restaurant franchisee in the U.S. Pilot Volunteers launches to encourage team members to give back to their communities. Today, members have given close to 5,000 hours of service through the program. Pilot reaches 150 stores and ranks 99th on Forbes list of the 500 largest privately held companies. Jimmy Haslam is named Chief Executive Officer of Pilot Corporation. By now Pilot has grown to 146 total locations, including 96 travel centers and 50 convenience stores in 36 states with 139 operated restaurants, employing more than 5,000 people and selling 1.2 billion gallons of fuel a year. Bill Haslam is named President of Pilot Corporation. Pilot's first major acquisition of Pro Stop adds 11 locations to the network. 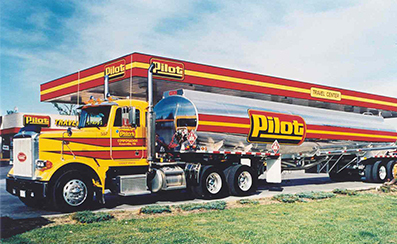 After partnering with Louis Dreyfus in 1992 and expanding rapidly in the travel center business, Pilot acquires Dreyfus ownership. Pilot buys out Marathon Oil's one-half interest to expand into a nationwide network. 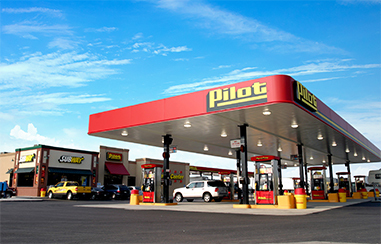 With 100 convenience stores and total annual sales of $175 million, Pilot opens its 1st travel center in Corbin, Kentucky. Jimmy Haslam is named Vice President of Sales, Development and Operations. After working at Pilot stores throughout high school and college since 1973, Bill Haslam joins Pilot Corporation and its board of directors following his graduation from Emory University. Pilot grows to 101 stores with annual fuel sales of about 117 million gallons. 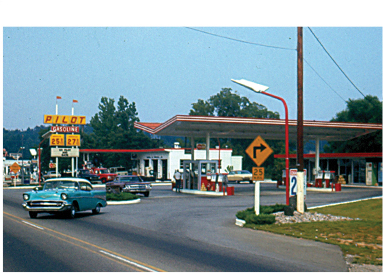 Pilot buys Lonas Oil Co. in Knoxville and converts almost all that company's locations to convenience stores. 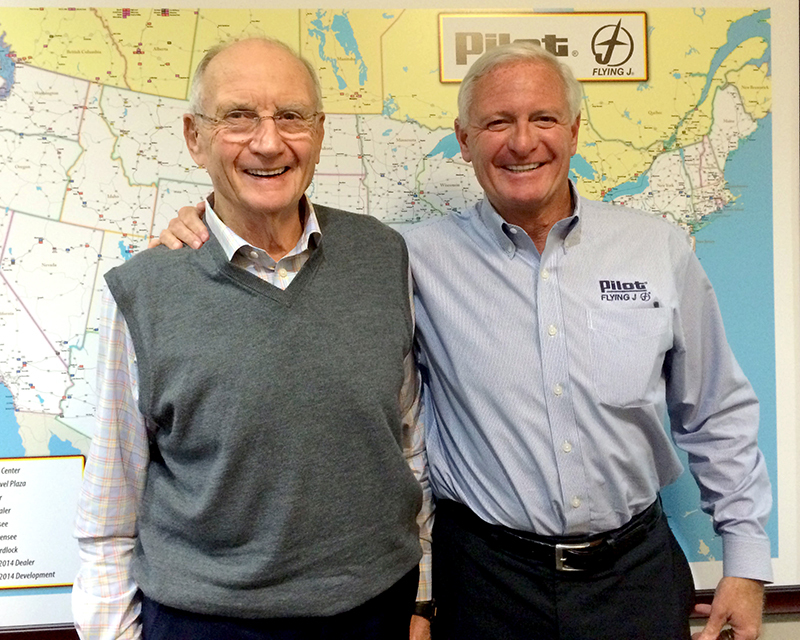 After working at Pilot stores throughout high school and college since 1969, Jimmy Haslam joins Pilot Corporation, and then in December marries Dee Bagwell Haslam who later becomes a partner in the business. Pilot opens its first convenience store on Alcoa Highway in Knoxville. James A. "Jimmy" Haslam III joins Pilot's board at the age of 20 following the passing of his mother, Cynthia. He is a senior at the University of Tennessee. Pilot has 59 stores and annual sales of about $50 million. Pilot reaches 35 store locations, selling more than 25 million gallons of fuel. Pilot grows to 21 store locations, selling more than 11 million gallons of fuel. 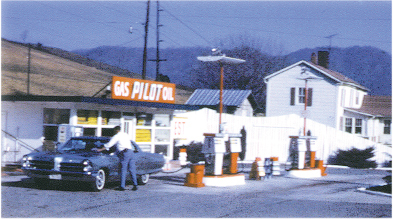 Pilot owns 12 stations in Tennessee, Kentucky and Virginia, selling 5 million gallons of fuel annually. Marathon Oil Co. buys half of the $2-million-a-year Pilot and loans $4 million to build new locations. The board of directors includes James Haslam II, Cynthia Haslam, Bob Campbell and three representatives from Marathon. 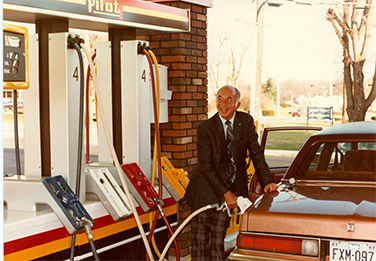 Pilot's spirit of community and philanthropy was established by founder Jim Haslam from the start. Today, the company strives to help build healthy communities through initiatives that support four pillars of giving: health and education, veterans, professional drivers and community development. James A. "Jim" Haslam II opens 1st Pilot on Nov. 20 in Gate City, Virginia, paying $6,000 for an existing location. Gas costs 27.9 cents per gallon.